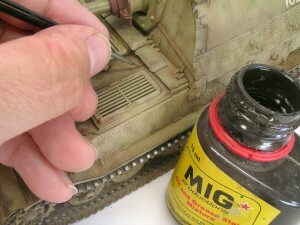 Mig Productions’ ‘Oil and Grease’ mix was used to simulate spreading oil stains on the engine deck area. This would have been constantly accessed due to this complicated vehicle’s mechanical unreliability. 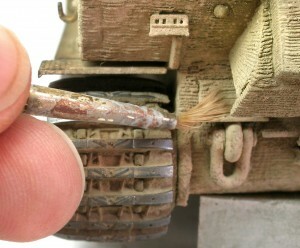 Dry pigments were flicked into the recesses of the model’s rear panel. 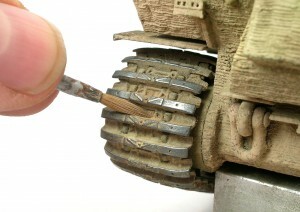 Pigments were applied in the gaps between track links, which has the useful benefit of disguising the small ejector-pin marks on the tracks’ outer faces. 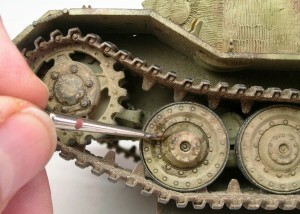 More ‘Oil and Grease’ mix was applied to the wheel hubs to suggest leaking bearings. 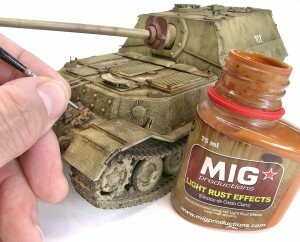 Mig Productions’ Light Rust Effects’ is a quick and easy way to create a light build-up of rust. Best build I have ever seen.